You are here: Home » Blog » Opinions » imagine » Has Dyson lost his way? ← Management Science or just Superstition? I know it is an act worthy of excommunication amongst the congregation of inventors, innovators and technology entrepreneurs to criticise Sir James Dyson. All those stories of success in the face of huge challenges, the amazing 5,126 prototypes that it took to develop the Dual Cyclone™ technology (vacuum cleaner) and “15 years of frustration”, makes criticism heresy. The latest product to come from the legendarily inventive stable of James Dyson is the “Dyson Air Multiplier”™. This is a £200 ($300) desk fan. The website shows people being amazed by the fact that air is coming from the device without any visible means of propulsion. It is clever, darned clever, reportedly taking “every discipline form Dyson’s 350-strong team of engineers and scientists to develop”; clever, but dumb. Apparently by not having any blades (I bet it does – you just can’t see them) it prevents buffeting. Buffeting? Is buffeting a major cause of annoyance in the office environment? Is that seriously an unmet need? I know that I find buffeting unpleasant, but only when my Bloody Mary ends up in my lap at 30,000ft. Even if I suffered from buffeting at my desk, I’m darn sure that I don’t value that need so highly as to pay £200 for a solution when I can get a buffeting one for £15 (I’ve put them next to each other to help you decide). I know the Dyson effort is beautifully designed, but it is not a work of art and is not going to achieve the iconic status of an Alessi. Remember the Dyson washing machine, the £1,200 “Contrarotator”? Well Dyson got into trouble with the UK Advertising Standards Authority over that by claiming that it outperformed the best washing machines” whereas “Which?” magazine’s research had concluded that it was no better than its “best buy” Bosch machine (as reported in The Independent 21 June 2001). The Bosch was half the price. The Contrarotator has quietly disappeared, perhaps for the same reason that the “Air Multiplier” is likely to. Why? I believe that Dyson is out of touch with the needs of their potential customers. Coming up with cool technology is of little use unless it fulfils a real need, and at a price that is commensurate with that need. The holy trinity of technology product development: design, market need and price. The Contrarotator failed to fulfil the need of providing better clothes cleaning than its competitors. The Air Multiplier and the Contrarotator are both crazily overpriced. Is that a serious need? I’ve lived in flats with very small kitchens and I’m not sure what value I would have put on the few square inches of space saved by a square kettle vs a round one of the same volume. When I lived in those flats, I was a poor student who could afford nothing more. So, if that need existed, it did so in conjunction with a distinct lack of disposable cash. So Dyson’s pricing policy is likely to exclude it from the market it appears to be aiming at. Maybe Sir James needs to get out and meet some ordinary people with ordinary needs, unmet needs. This entry was posted in imagine and tagged design, markets, product management, users. Bookmark the permalink. 12 Responses to Has Dyson lost his way? Somebody had to say it Chris! Respect the size of your kitchen – I’ve seen it, and yes space saving has to be a good thing, but I think the difference between a round kettle and a square one will not be enough! while i do like dyson products, i have to agree with you on this one. There is no way i will spend that much on that “air multiplyer” when i can get a $10 box fan from walmart here in the us. Buffeting doesnt bother me that much to where i wld want to shell out x amount of dollars to et it to stop! I like their products too, and I want them to succeed. 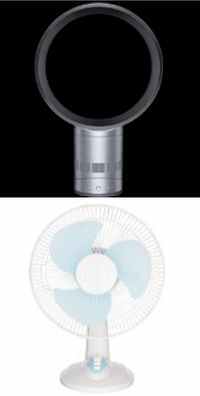 We need better designed products and it looks to me like the Dyson fan is way better than that horrible cheap plastic thing I found. But is that really a $300 benefit? I tend to agree. I’ve blogged about (and own) a Dyson vacuum and like it a lot. It really works well and is well designed. My doctor’s office has a Dyson airblade hand dryer in their bathroom. It’s a cool device, but i’ve seen similar hand dryers made by other companies. I had heard about the Contrarotator, but hadn’t really looked into it. I agree that at hundreds of dollars (I live in Canada), the Air Multiplier is a real expensive fan. I had never thought about “buffeting” much. I was more concerned about the force of the air blower papers off my desk. I doubt the Air Multiplier addresses that issue. Maybe Dyson isn’t really out of touch, but simply the process of invention and product development requires failure in order to bring success. For every Dyson Vacuum, there will be several Contrarotators and the like. Time will tell if the AM is a hit or a miss. The question I would ask is whether the lack of blades and thus lack of surrounding cage, gives it application in places where traditional fans aren’t usable. You make a really good point about being able to fail – I think it is so important that people feel they can do that when developing a product. We do need to be well connected with our market to spot a failure before it actually reaches the market though. That then leads onto the whole issue of how to spot a success, which few, including me, can do reliably. When I first read this, I thought that perhaps Dyson had created a silent fan, or a fan that used a fraction of the power. I was quite disappointed to discover that it pushed the air the old fashioned way, albeit in a cunningly reworked version of the ‘air hockey’ game from the arcades of my youth. Since the Dyson is flapping about in the air squawking and fluttering, I may as well take another couple of pot shots at it. Then there’s the contrarotating washing machine. I did like some of the principles of this machine. Firstly, it could take a much larger load without the machine occupying more space. Secondly, it claimed to avoid the ‘knotted clothing’ effect. Unfortunately, apart from the cost, they apparently didn’t work that often. We often forget that the most important thing about a washing machine is that it must never break down. Ok I admit that we have a dyson cleaner, and it just works. Damn! No way am I suggesting that some of Dyson’s products work, just that after the early success of making a “better” vacuum cleaner, they’ve rather lost their way. I’m also not suggesting that good design is not of great value – it is. Nor, that innovation and invention are not good – they are vital. But, we do need to make sure that we contribute something, something that benefits people’s lives in some way, otherwise what is the point? This seems like a classic product management problem. I’ve seen many software companies do the same thing: they become so concerned with what they CAN build, that nobody stops to ask what they SHOULD build. It seems to be worse in companies that managed to luck out with a strong commercial success of a technological wonder. I would argue that Dean Kamen (inventor of the Segway) fell into that trap as well. And before Kamen came another great UK inventor; Sir Clive Sinclair. Produced a series of really great electronics products and then demonstrated he had no idea of what people wanted in terms of transport by creating the Sinclair C5. Doh! Agreed. But ofcourse there’s the ‘unmeasurable’ need for ‘cool’ products. If not there wouldn’t have been the need of luxury segments in most product lines. I agree that “cool” certainly has a value as does a brand associated with luxury products, but I don’t think they are the same. I also think Dyson fail to hit either the cool or the luxury target. Luxury car, luxury handbag, luxury wine, luxury desk fan?